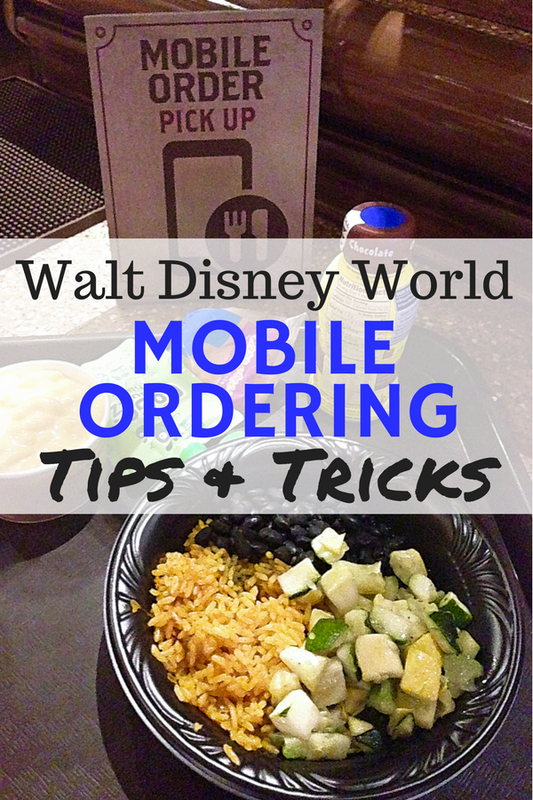 How To Use Disney World Mobile Order + Tips! Earlier this year Disney rolled out a way to pre-order your meals at select quick-service restaurants using the My Disney Experience app. 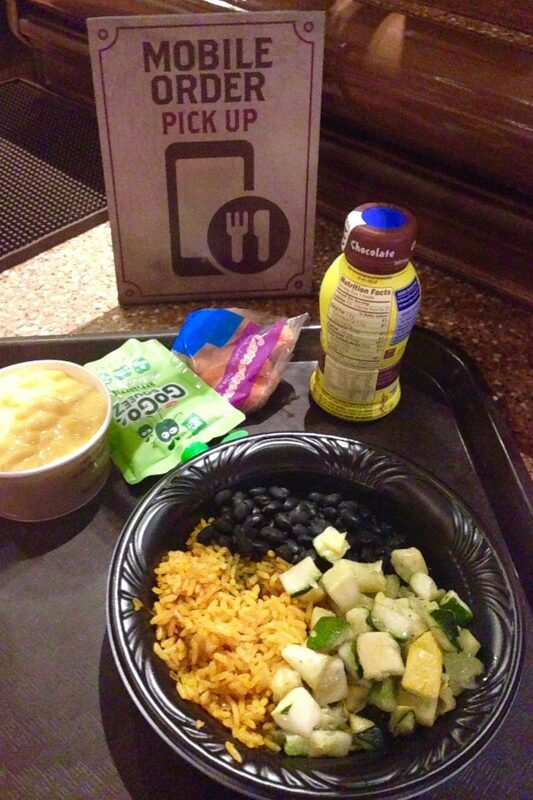 I have to admit I was skeptical – would Disney World Mobile Order really improve my dining experience at Walt Disney World? Or would it be more hassle than help? Well, I tried out mobile order at the Magic Kingdom recently so I’ll share my experience (and some tips and tricks) with you today! Where Can I Use Mobile Order? I expect that if enough people use this option, it will expand to most quick service locations in the parks and at Disney Springs in the future. You do need the My Disney Experience app on a smartphone to place a mobile order. When you open the app, tap on the image of your character and select “Order Food” within My Plans. It is very easy to find in the app. 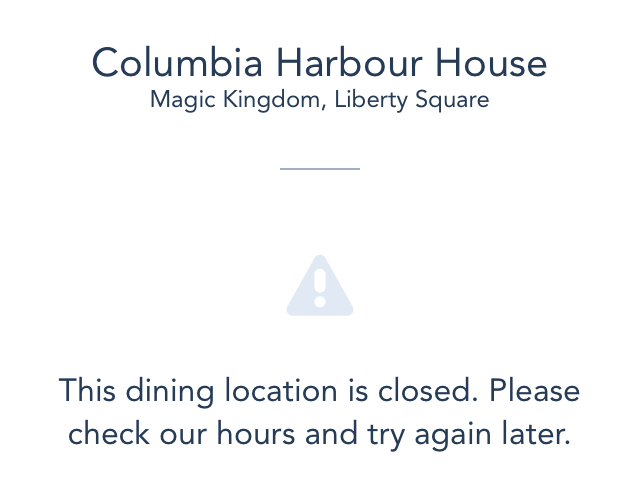 You can only place a mobile order at a restaurant on the day you plan to eat there and when the dining location is open.I assumed I could order my lunch when I was riding the bus to the parks in the morning, but that was not the case. 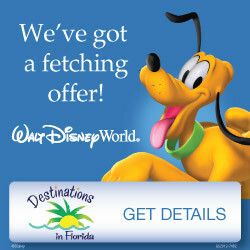 You can use a credit card, debit card or Disney Dining Plan to pay for your order. 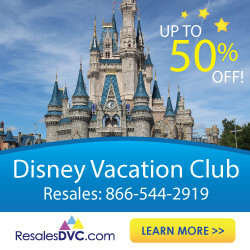 If you want to pay for your order with a Disney gift card or apply a discount (such as an Annual Pass discount), you’ll have to order in person at the restaurant. I often only bring my Magic Band and ID with me to the parks and forgo bringing my wallet. I was concerned that I would not be able to use Mobile Ordering because I didn’t have a credit card in hand – but luckily that wasn’t the case! When I ordered, the app charged my meal to my credit card on file in My Disney Experience, and I did not have to enter a card number. 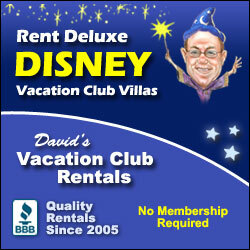 Keep in mind this is distinct from any room charges that you may be putting on your Magic Band. We decided to eat lunch at Pecos Bill in Frontierland, which opens at 10:30 am. 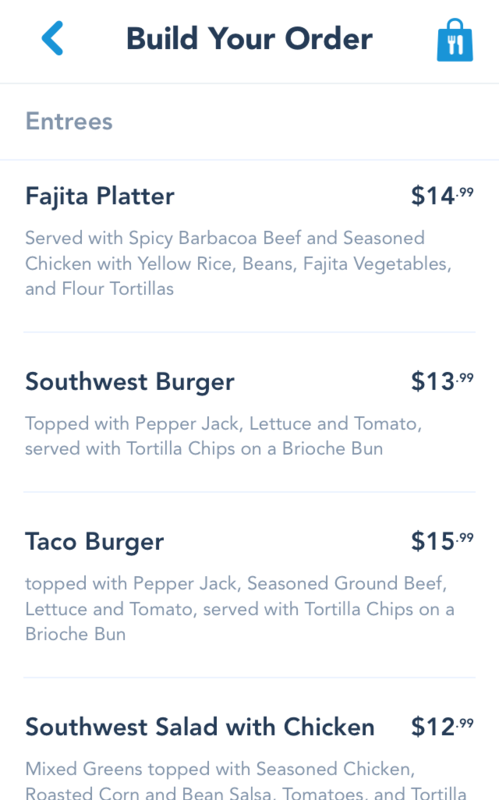 You can see all of the menu items in the app, and it was easy to select and customize our order. I was even able to add a Mickey straw to my daughter’s kid’s meal, which I had been meaning to do throughout the trip but always seemed to forget! I placed our order while waiting in the FastPass queue for Peter Pan’s Flight. I loved being able to take my time looking at all of the menu items. I always feel rushed when ordering at quick service restaurants, especially with those annoying screens that change just when you are about to decide on your meal! After I completed my order, this notice was in the My Plans section in the app, making it very easy to find once we were ready to eat. 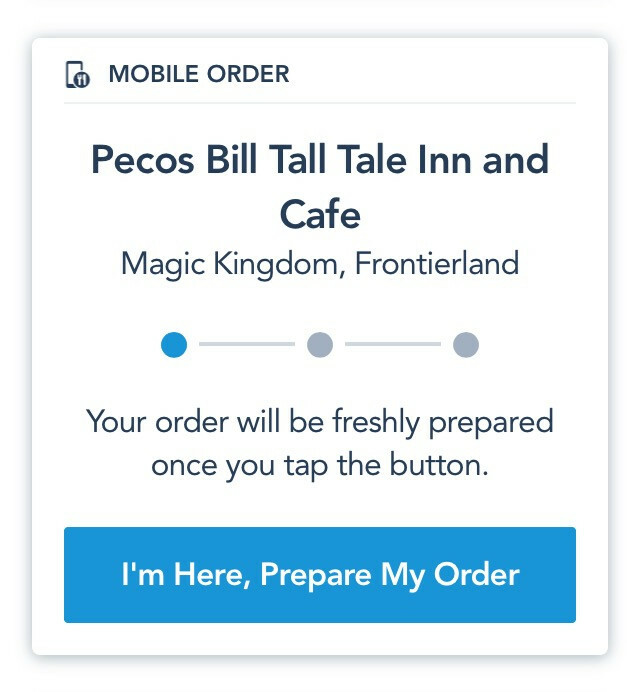 I didn’t wait until we are actually at Pecos Bill’s to click the “I’m Here” button. I figured it would take about 5 minutes for cast members to prepare my order, so I clicked it as we started to make our way towards Frontierland. While your food is being prepared, you will see this notification in the app. 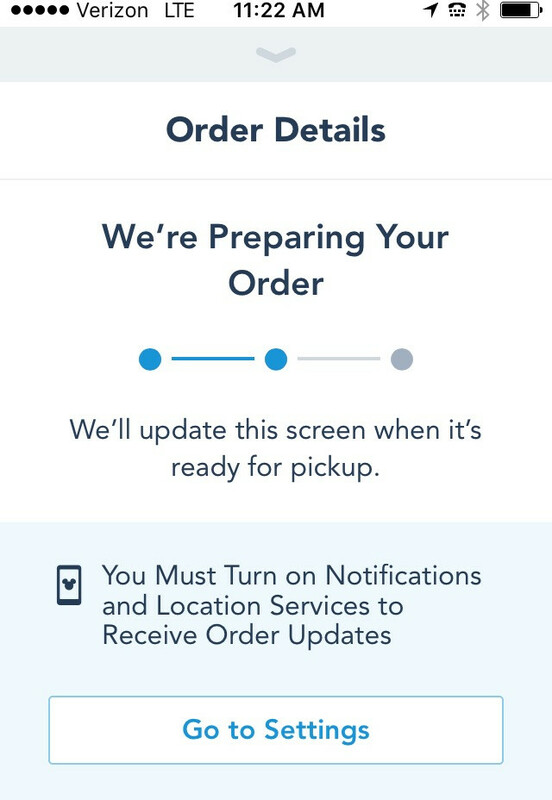 Note that you do have to have notifications and location service enabled for the app in order to receive updates for your order, so be sure to do that in advance. Four minutes later, I was notified in the app that our order was ready! We were just walking up to Pecos Bill, so the timing was absolutely perfect. There was a special area assigned for Mobile Order pickups, which was clearly labeled and easy to find in the center of the counter. As I approached, a cast member asked “Are you Leah?” and had our order ready to hand directly to me. I have to admit that I was pretty impressed. Another guest picking up his order told me that he had used mobile ordering a bunch of times on this trip and loved it. There was already a line building for the lunch rush at Pecos Bill, so I loved walking right in and having our food waiting for us. I would suggest planning to be there right when your order is ready. I can see food being served cold if there is much of a delay. But since we timed it right, our food was plenty hot. 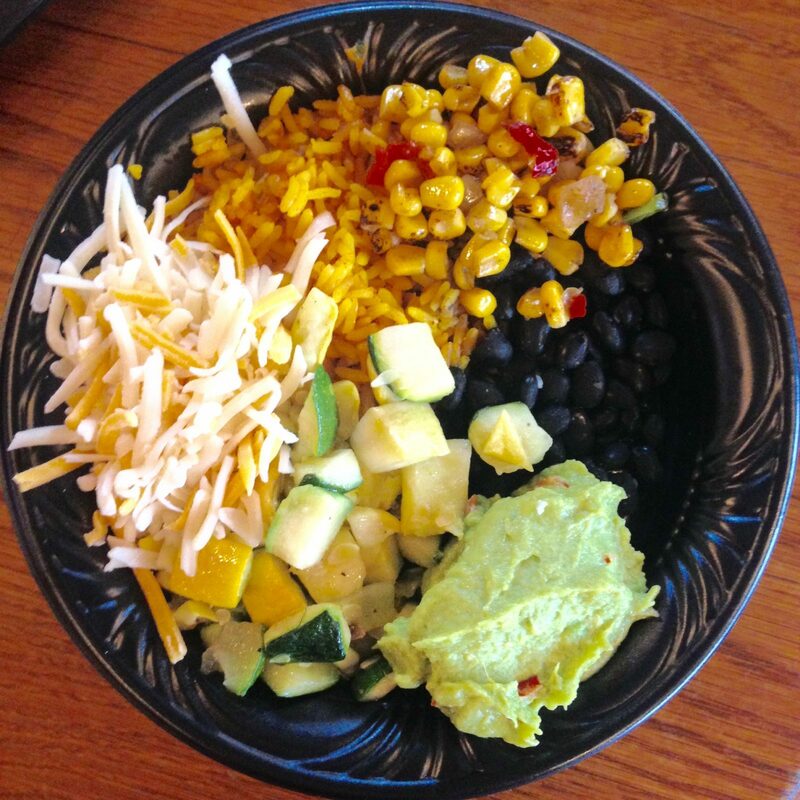 And of course, I loaded my veggie bowl up at the toppings bar! That’s my favorite part of dining at Pecos Bill’s. 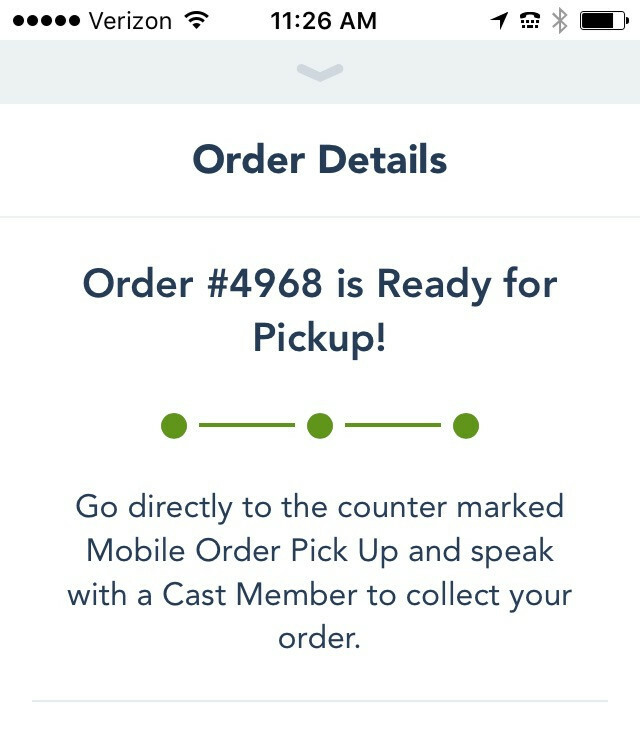 I was very impressed with my Disney World mobile order experience. Once I figured out the ground rules and how the process worked, it was incredibly easy and convenient. In fact, later that afternoon we stopped by Aloha Isle for my favorite snack, a Dole Whip swirl, and the line was crazy long. I remembered seeing Aloha Isle as a mobile order location earlier that day, so I opened up the app and was able to quickly place my order. 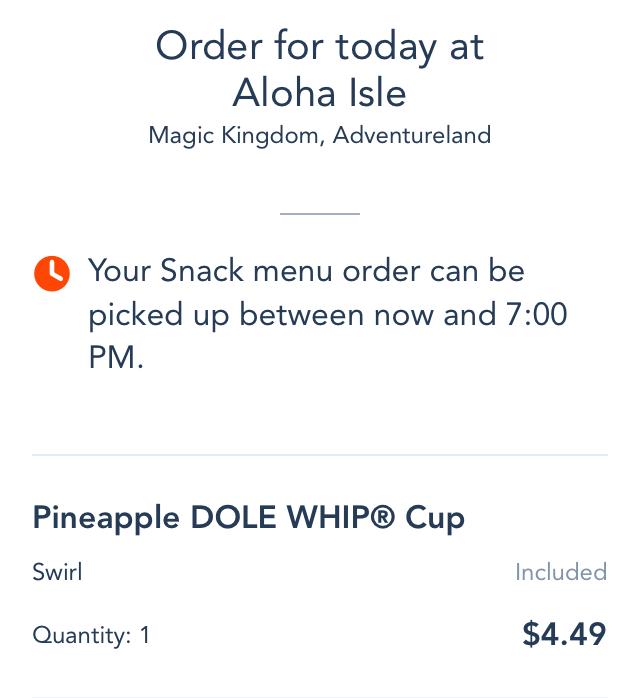 My Dole Whip was ready a few minutes later and I effectively skipped the line by using Mobile Order! I think I am hooked. 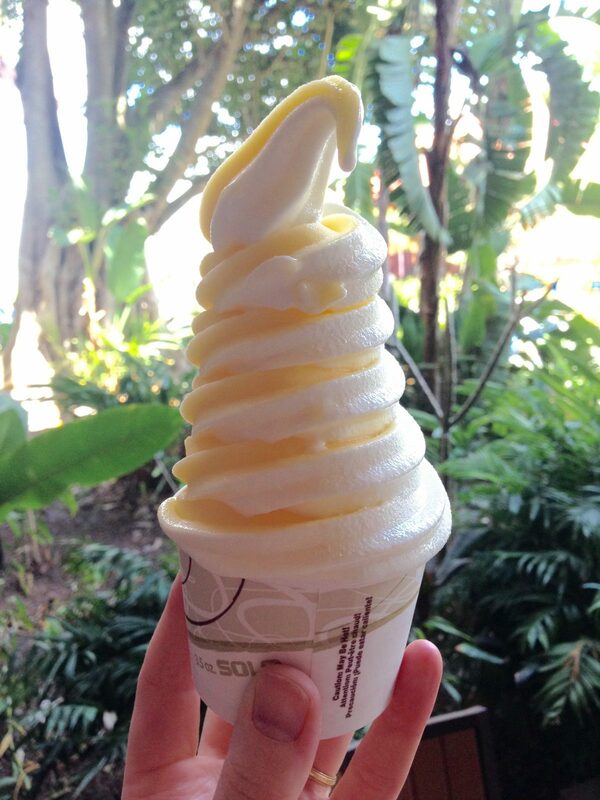 My Dole Whip was ready a few minutes later and I effectively skipped the line by using Mobile Order! I think I am hooked. 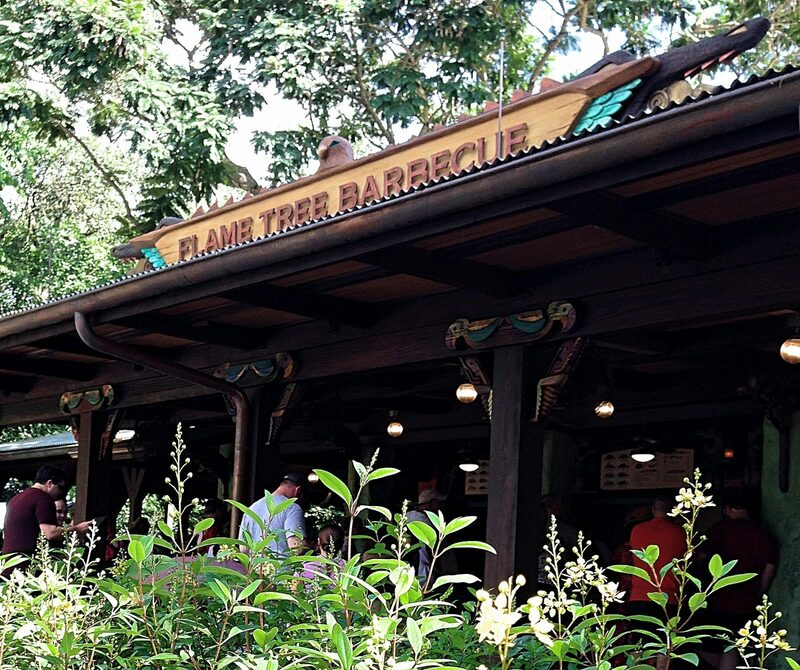 In summary, I strongly suggest giving Mobile Order a try if you plan to eat at a popular quick service dining location (such as Satu’li Canteen, Flame Tree Barbecue, Columbia Harbor House, or Pecos Bill) at a peak time. I can’t see it saving you any time if there isn’t a line due to eating at an off-peak time or at a less-popular restaurant. 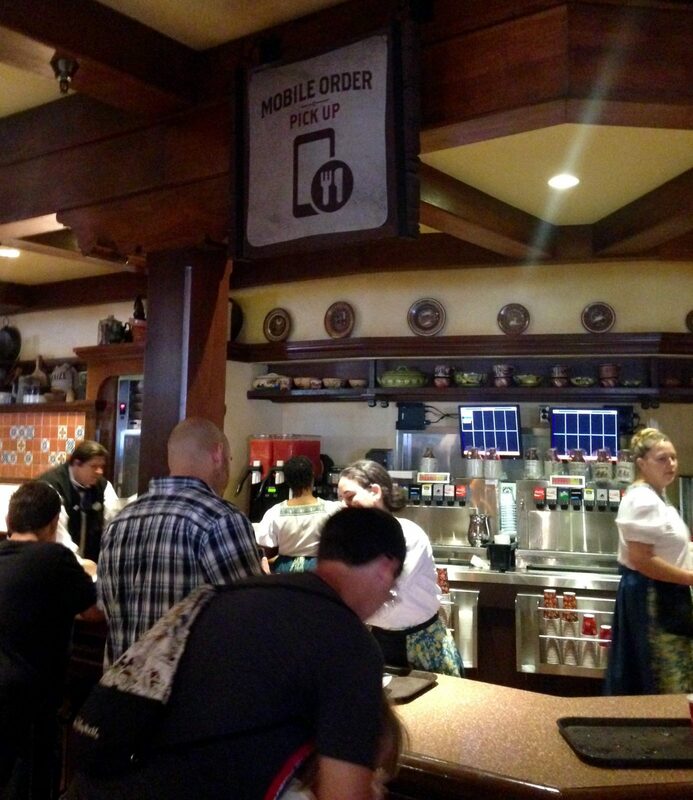 Any questions about mobile ordering at Walt Disney World? 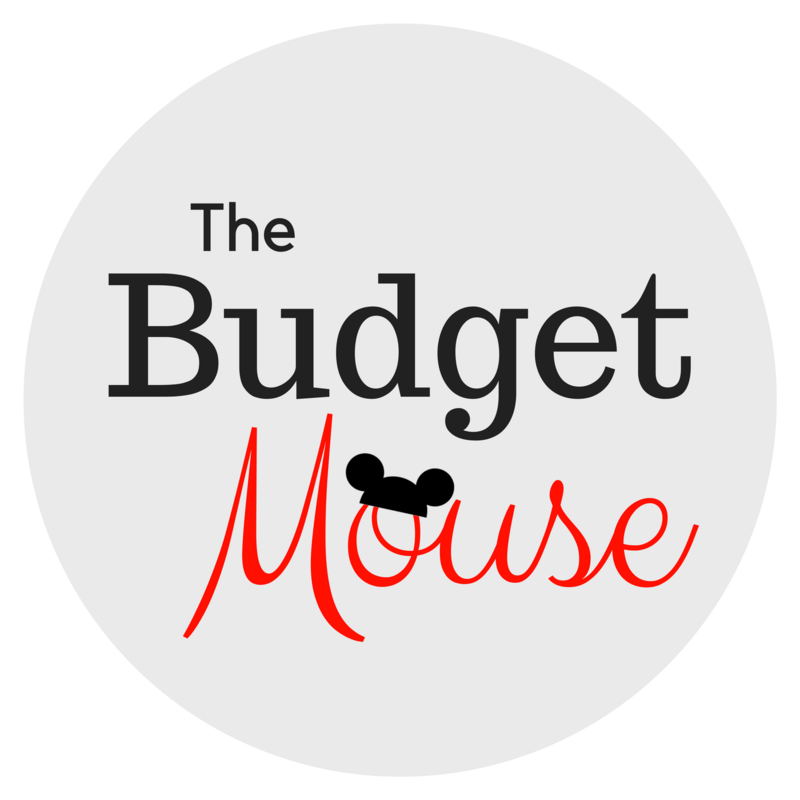 Feel free to send me a message on The Frugal South’s Facebook page! so awesome! Can’t wait to use on our trip in a few weeks! thanks for the info! 2019 Epcot Food And Wine Festival Tips & Tricks! Tips for Visiting Epcot Flower & Garden Festival With Kids!